I think obsessed is the word I would use to describe my relationship with peanut butter. And that might even be downplaying it. It's always been a favorite food of mine, especially in the form of a Reese's Peanut Butter Cup. my problem with those however was that there were never enough peanut butter. 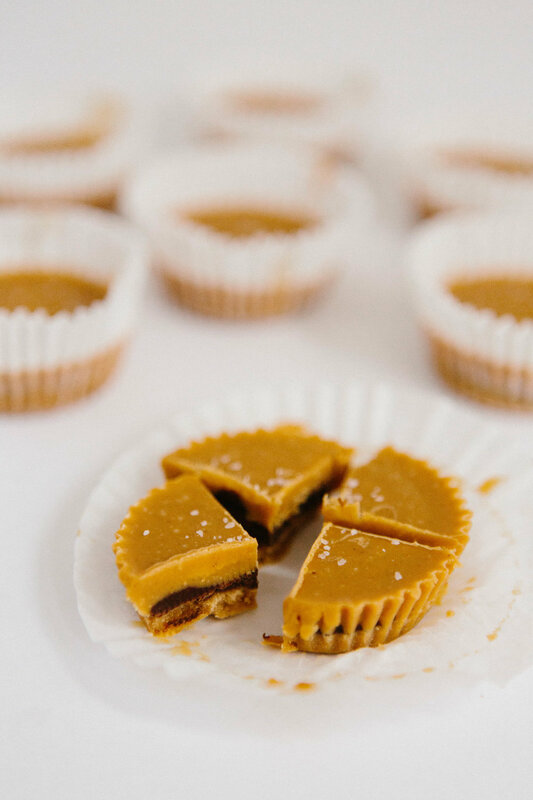 Don't get me wrong, I love chocolate, I do, but when it comes to peanut butter in desserts or candies, I think the more the merrier. 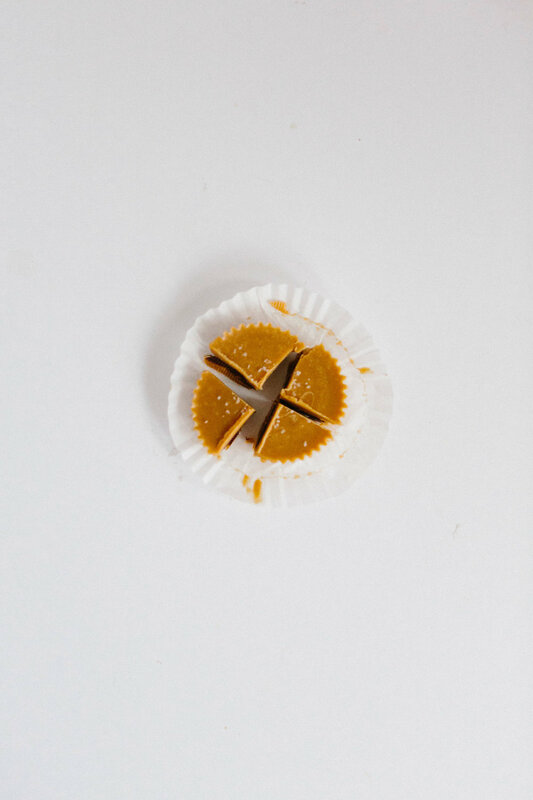 These peanut butter cups provide my preferred ratio and utilize much more health conscious ingredients than any packaged peanut butter cup ever will. 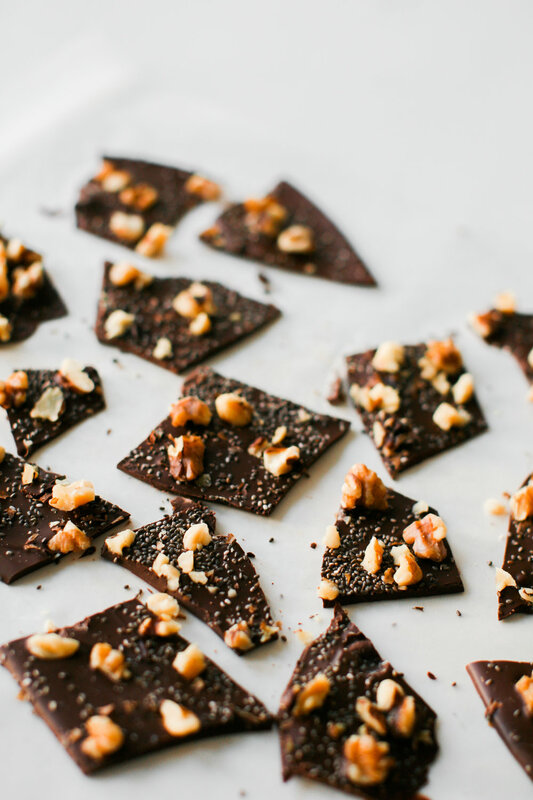 Make these and keep them in your freezer for when that post-dinner sugar craving strikes. These are only slightly sweetened, which is my personal preference, but if you prefer them much sweeter, just increase the amount of maple syrup and enjoy. Line a muffin pan with paper liners. Melt together the peanut butter and coconut oil in a saucepan over medium-low heat. Add in 1 tablespoon of maple syrup. When the mixture has melted completely take out 1/2 cup of the mixture and set aside. Add in 2 tablespoons of cocoa powder and 1 tablespoon of maple syrup to the peanut butter and coconut oil mixture you set aside. 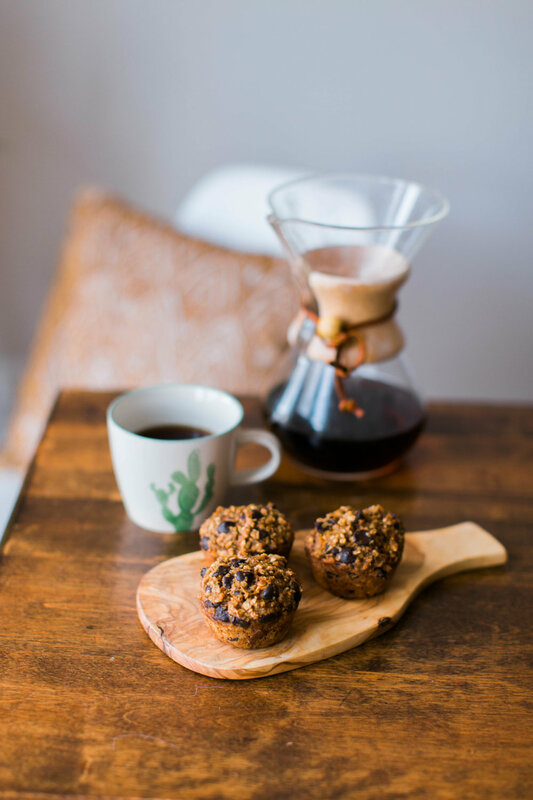 Using the peanut butter and coconut oil mixture that is still in the saucepan, pour the mixture into the paper liners in the muffin pan. Only fill the cups about half full and then place in the freezer. Allow that layer to freeze and then pour the chocolate layer on top and then allow that layer to freeze. Finally take the remaining peanut butter coconut oil mixture and pour it over the top of the chocolate layer and then place in the freezer. Once the final layer has frozen you can enjoy. Store in an airtight container in the freezer. Because it's November and by now you've probably heard enough people pledge their loyalty to Fall as the most superior of season, I will avoid a long soliloquy about how I love oversized sweaters and would die for crisp temperatures and bonfires year round. But just know that I do and I most definitely would. Instead, I'll talk about traditions. Growing up it was a running joke that our family's tradition was having no traditions. I don't know if it's because my family likes to reorganize plans two hours before they're supposed to be carried out making it nearly impossible to actually uphold any sort of regular event or that we just didn't have any sort of sentimental value surrounding the idea of having them. This lack of emphasis on traditions might sound kind of sad to those of you that have super awesome traditions, but in our house the absence of traditions left so much room for spontaneity. One of my most favorite Christmas memories was the year we spent Christmas day at an indoor water park. The lines were short and the gift of being together and experiencing something became the present we actually cared about. Josiah on the other hand comes from a family that places a much stronger emphasis on traditions. When we first got married it was hard for me to understand the value that he placed on cutting a tree down the day after Thanksgiving or making donuts on Christmas Day. Don't get me wrong, I thought those things were cool (I mean, hello, donuts! ), but it wasn't until recently that I fully understood how important it was to him and could relate to the importance he placed on them. Although Josiah and I have yet to create any of our own traditions together surrounding the Holidays, one tradition that we have started is a yearly Fall drive to see the changing colors. Each year our trip looks a little bit different. The first year we did it we lived in Illinois and so we headed up to Wisconsin for a day of exploring. Our second year we were living in Colorado so we made a trip to Steamboat Springs, CO where we spent the weekend and enjoyed some great brunching and browsing in the little shops. This year we're in Chicago so we took a drive up to Lake Geneva, WI. We spent the day walking around the lake with Henry and then grabbed brunch at a cute little place that had a dog-friendly patio. Because of the business of wedding season we almost skipped our trip this year, but the thought of forgoing this short-lived, but meaningful tradition made both of us far too sad. Despite our crazy schedule, we packed up the car and ended up enjoying a full day together and I am so, so glad. I now see why Josiah thinks so fondly of even the simple things that his family does year after year. Going forward I hope that no matter how hectic October becomes, we continue to prioritize that time together and are always able to maintain this simple tradition. 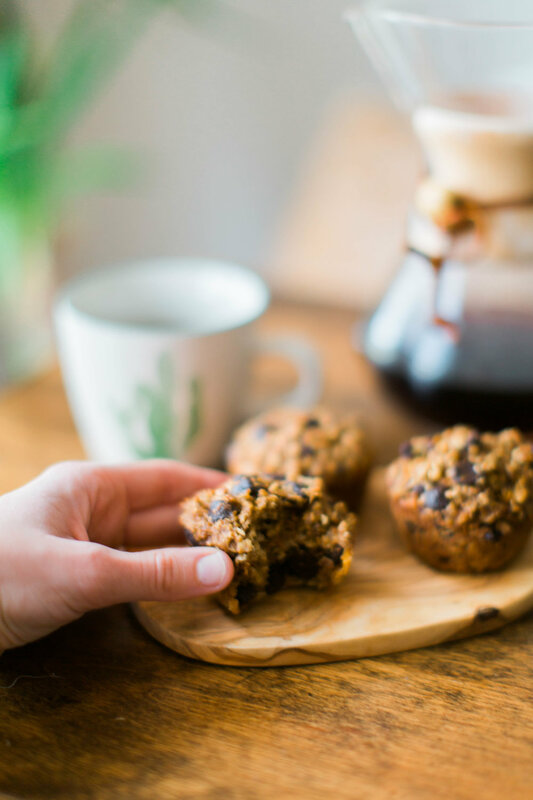 Whether it's a yearly thing or just a this-year thing I encourage you to bake these muffins, grab the people you love, pack up the car, and drive (through your neighborhood or across the state) to take in some Fall views. 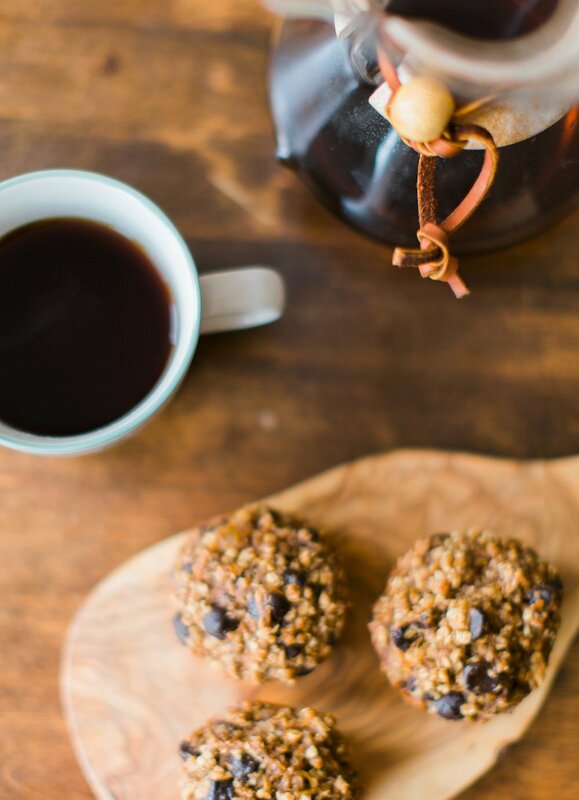 The sweetness of the chocolate combined with the comfort of pumpkin make these muffins the perfect treat for Fall. There are few combinations that trump chocolate and peanut butter, but chocolate and pumpkin comes pretty dang close. They're insanely moist and for sure going to become your favorite Fall road tripping snack. Preheat oven to 375. Combine the oatmeal, salt, baking soda, pumpkin pie spice, and cinnamon in one bowl and set aside. Next, combine the pumpkin or butternut squash, maple syrup, coconut yogurt, coconut oil, and eggs in another bowl. Add the dry ingredients to the wet and stir until they are all mixed together. Stir in the chocolate chips. Portion out into a greased muffin tin. Bake at 375 for about 16 minutes. Cool and serve. And here is Henry begging for some of the muffins. An herb garden has been on my summer bucket list for the last few years, but has always fallen to the wayside. Partially because we've moved a lot, but mainly because I was fearful of wasting time and money on something I would inevitably kill. "Houseplants that are impossible to kill" may or may not be in my recent google history. Guys, I've even killed succulents. I didn't even know you could do that! I think that it was actually from overwatering. Comforting to know my fault in that situation was just caring too much. This summer we decided to actually follow through on our herb garden dream. One of the first weeks that the farmers market was open we purchased some basil, thyme, chives, oregano, cilantro, parsley, and most excitingly, mint. (And tomatoes, which have been the most surprising survivors!) At first I used the herbs as just toppings. I didn't really know what else to use them for. THEN, I stumbled upon this recipe from Love and Lemons that I knew I had to try. 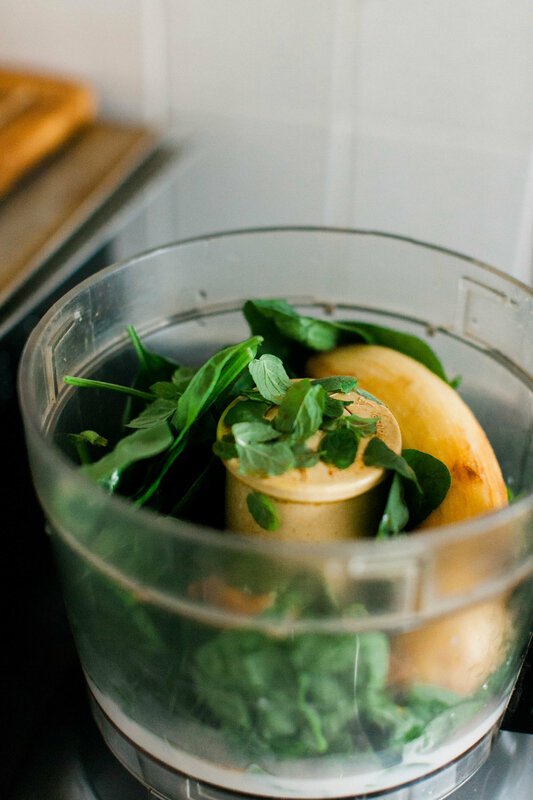 This recipe served as a dessert that delivered greens and brought my former after-thought herbs to the forefront. I used Califia Farms Almond Milk (because it will forever and always be the best almond milk next to homemade almond milk) instead of the milk that they suggested, but use whatever you favor. 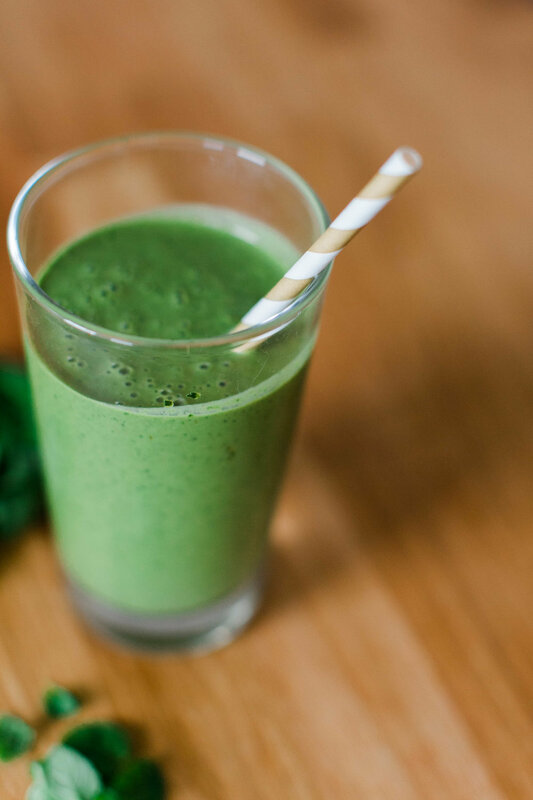 This shake makes the perfect warm weather alternative to dairy based shakes and is going to be on repeat over here all summer. 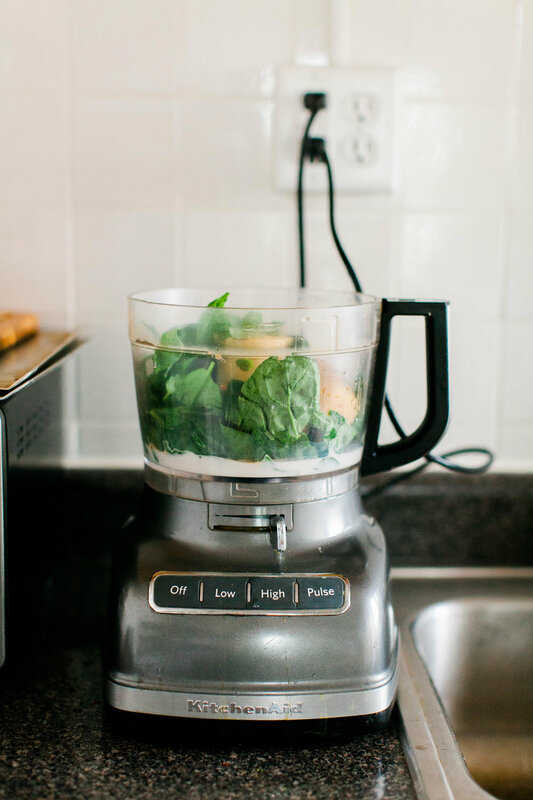 In a blender, combine the banana, spinach, mint leaves, almond butter, ice, vanilla and almond milk. Blend until smooth. Add more almond milk as needed for desired consistency. Pour into a glass and serve. This is a recipe I have been meaning to share for a bit, but I have been attempting to overcomplicating my words. So in an attempt to keep things super simple all around I'm not going to worry so much about the words, but know that it's a must make! It's great to make and keep in the fridge for a post-dinner treat or to wrap up cute and deliver as a gift! 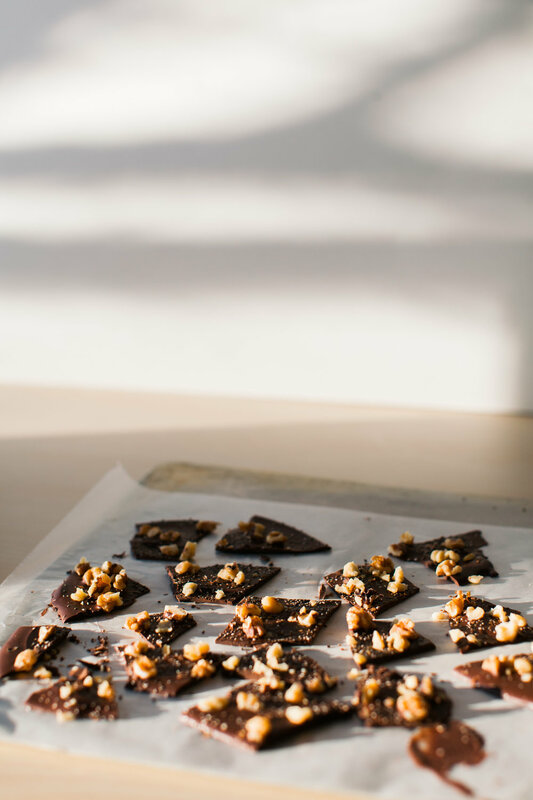 The insanely simple nature of this recipe in combination with it's insanely delicious dessert qualities make me OBSESSED and I am certain you're going to be too! Josiah and I have found a church in the city that we love! I'm still working through Grey's Anatomy and it's slowly turning into background noise. Is it worth continuing to watch? Can This Is Us please come back already?? I've been running consistently, mostly in the morning, and it has made me feel amazing! If you have some good running tunes recommendations I would love them, because as much as I love the Hamilton soundtrack you can only hear it on repeat so many times. Amazingly my limit was 9,789,478 times. I'm thinking that I am going to start another Whole30 the next time I have to get groceries, which will probably be this Wednesday. Who's with me? Things are looking to warm up in Chicago! This coffee creamer is totally my new go-to. Have a fantastic week, friends! Place chocolate in a saucepan on low. Continue to stir until the chocolate is thoroughly melted. 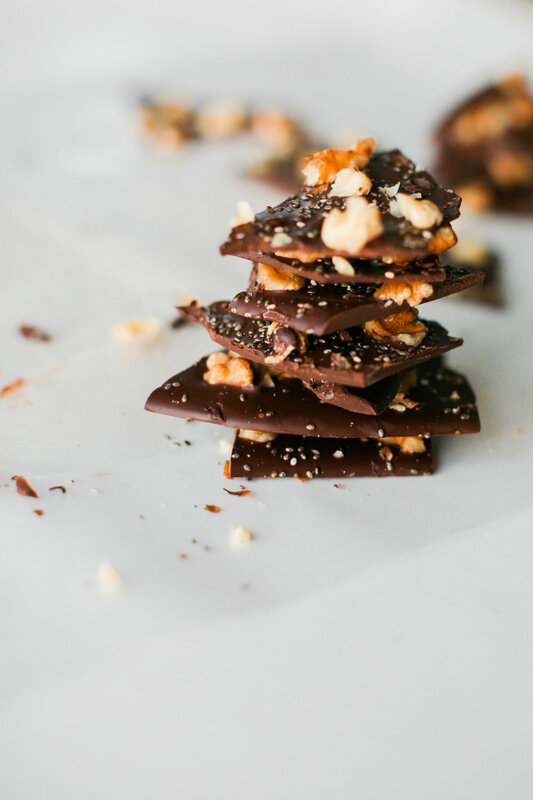 Pour the melted chocolate onto a sheet of wax paper and spread it equally around. 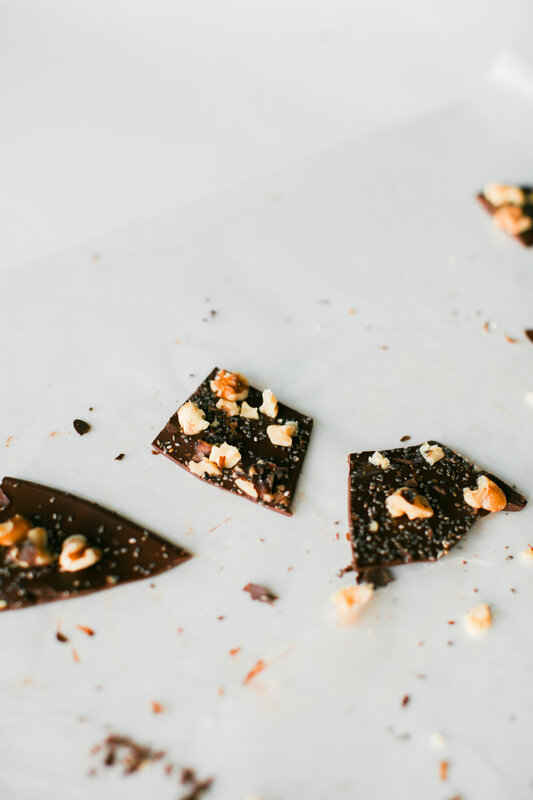 Sprinkle the chia seeds, walnuts, and whatever other superfood additions you think of. Coconut flakes, almonds, cranberries, or pumpkin seeds would be phenomenal! Allow the chocolate to harden. If you're in a time crunch you can put it in the freezer for about 10 minutes. Once the chocolate has hardened take a knife or use your hands to break the bark into pieces. Place the bark in an airtight container and store it in the refrigerator.